Yesterday my son Misha and I went to Youngstown, OH to race sprint distance triathlon. This was second time Misha raced in his life and he took second place in his age group - only 4 seconds behind the first place! And that is considering that his training was a year of gymnastics, plus school phys ed classes :-). 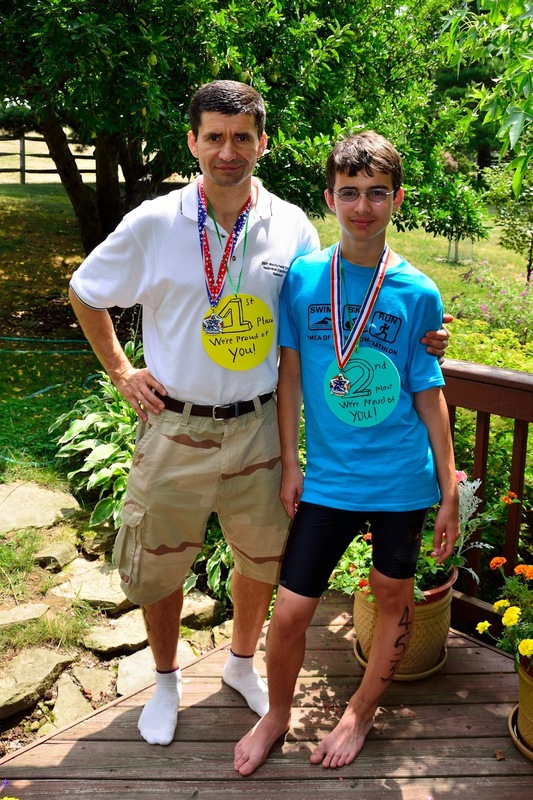 I took an overall win with 1h 4m 1s (across all age groups with total 95 finishers). Complete race results here. 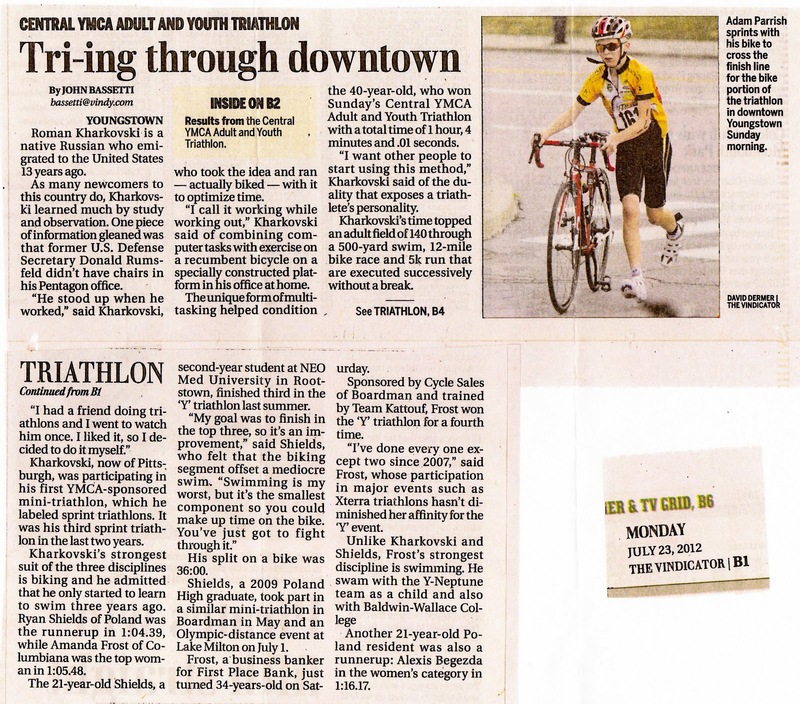 This was my third triathlon race ever and all of my races so far were sprint distance. I was sure surprised as hell to take an overall win. I was gunning for the first in my age group :-). When we got home we got a second set of medals from our family :-). The morning of the race we got up at 5 am and drove for little over one hour to the place. The race started at 7am, but when we arrived at 6:25am we had plenty of space in transition area and I used the very first rack to the exit to put my bike on. I think this helped me to get the best T-1 time of 30 sec - that is 12 seconds faster than the next best T-1 split. My T-2 time was 36 seconds - not bad, but it was 13 seconds slower then the best T-2 time in the race. I ran with no socks, but need to figure out a way to put my running shoes faster. I do use rubber laces on my Kinvaras, but it still is taking forever to put them on. The swim part was 500 yards and my time up to a transition entrance was 9:22, which means took me 9 min 12 sec to swim, which is 1:50 per 100 yards. Very slow. Just the day before the race I set my personal best swimming three consecutive 100 yards in 1m 35 sec with 20 sec rest in between. I think if I had a chance to swim at least 10 min to warm up I could have done much better, but the time between heats was only few min. The bike part was 12 miles on a slightly hilly terrain in the city and in the park. I pressed on the bike - not quite an all out effort, but close. It was a lovely ride with beeeeeeautiful scenery in the park - and half of the ride was on a very good pavement. My bike split for 12 miles was 34:09, which is 21.1 mph average speed (33.9 km/h). The run was 3 miles on a pretty hilly terrain and I finished in 19:26, which is 6:29 pace. Not bad, but right after I finished I realized I could have pushed much harder on the second half of the run. First half was quite hard (I always think at the beginning of the run - why do I even do this stuff? ), but just like back in May, I should have gone all out in the second half and I just held the pace only sprinting the last 100 yards, instead of gradual increase of pace all thru the second half (mental note to myself). On the up side, I think I can maintain this pace in the Olympic distance on 10K run without a problem. That is unless the bike leg (which is twice as long) takes too much more out of me. I did a short taper before this race - did absolutely nothing on Friday and swam 2,500 yards on Saturday with no biking and no running two days in a row before the race (not considering an hour long game of ping pong with Misha - looser was to vacuum the first floor in the house and I just had to win that battle :-) ). Starting 9 days before the race I stopped all cross-training work. No pullups, pushups, etc. Overall felt very strong on race day with no signs of fatigue.The week of the race I had a total of about 12 hours of training while the week before that was my peak for the year - 17 hours in one week. Thanks goodness my runners knee issue is almost gone now for two full weeks. I still do not do long runs yet, only up to 6 miles at a time (in under 20 miles per week), but it seems like I can get back to normal mileage of 25+ miles per week. Next race is in September - Portage Lakes, OH. Can't wait to do my first open water swim and the first Olympic distance there! The best part of the day was having our friends over and Anatoliy teaching me a master class on how to cook Uzbek Plov dish. Here is the final dish, I will post a complete blog on how to cook plov.